We will be happy to accept free returns purchased from silverjeans.com within 45 days of the original date of delivery. 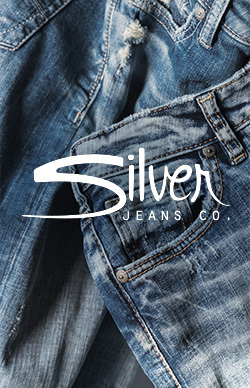 We only accept returns for garments purchased through the Silver Jeans online store (www.silverjeans.com). If you have a concern regarding an item purchased from an independent retailer please contact them directly. All returns should have the tags still attached. We cannot accept washed and/or worn merchandise. Just go to www.silverjeans.com/rmarequest to request the pre-paid return label. The return request will be reviewed and approved within 1-2 business days and will come in the form of a PDF attachment that will need to be printed. Once you have the label on the outside of the package you may arrange pick up with UPS (by phone, online or dropping it off at a UPS store). Please be sure to include the original packing slip in with the return. DRI c/o SILVER JEANS CO.
To facilitate your return process, please return the item(s) you DO NOT want and place a BRAND NEW order for the correct item(s). This process ensures you can receive your new item(s) before your incorrect item(s) are returned. Once we receive your return, your refund or credit will be issued. If your return situation involves unusual circumstances and/or you are not completely satisfied with the quality of your garment, please get in touch with us and we will be happy to assist you.